Sometimes it's just non-stop thrills. Today on Dartmoor we had waterfalls, plunge pools, real live soldiers letting off explosions and firing guns, and mysterious underground chambers. 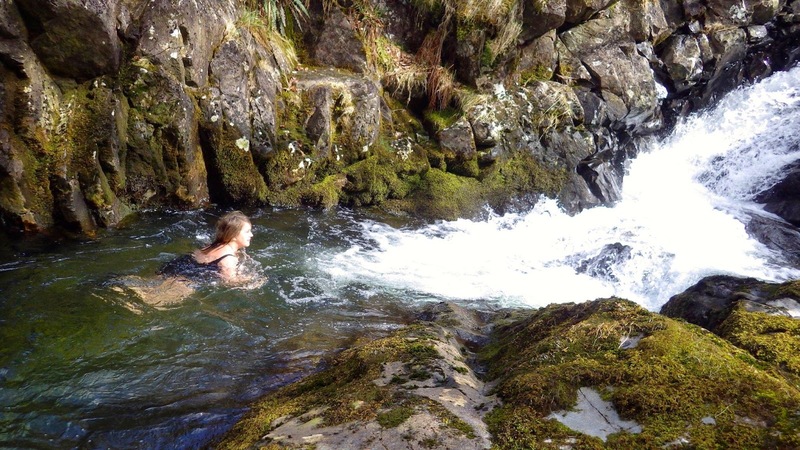 We set off from Okehampton up the brilliantly bubbly East Okement River where we frolicked in the numerous frothy pools, before heading out onto the Moor past the Nine Maidens stone circle and down to Cullever Steps. Here we found a military exercise in progress, complete with bangs and smoke (although they were firing blanks). Then it was up and over into the next valley where we lolled around in the peaceful waters of the River Taw whilst gazing up at mountainous Steeperton Tor above. Then, on the way back towards Belstone we noticed what looked like a sunken bunker, with strange glass and metal hatches. Imaginations immediately started running riot with thoughts of waterboarding and other nefarious uses, but a little research showed this was an ill-fated attempted in the 1950s to extract water from underground. Thanks to Lynne for the photo of me swimming. Today started dull, but by the afternoon the sun was out, and it was warm and hazy, and everything felt alive and zingy with the promise of Spring. I even started to get rather hot. Of course the minute this happens one's thoughts immediately turn to a nice swim, and I wanted to be on top of the Moor, out in the sunshine. By the time we got up there though, although there were a few pink streaks in the sky, the opportunity for a sunset swim had passed, and the temperatures were falling rapidly. It was still beautiful though. 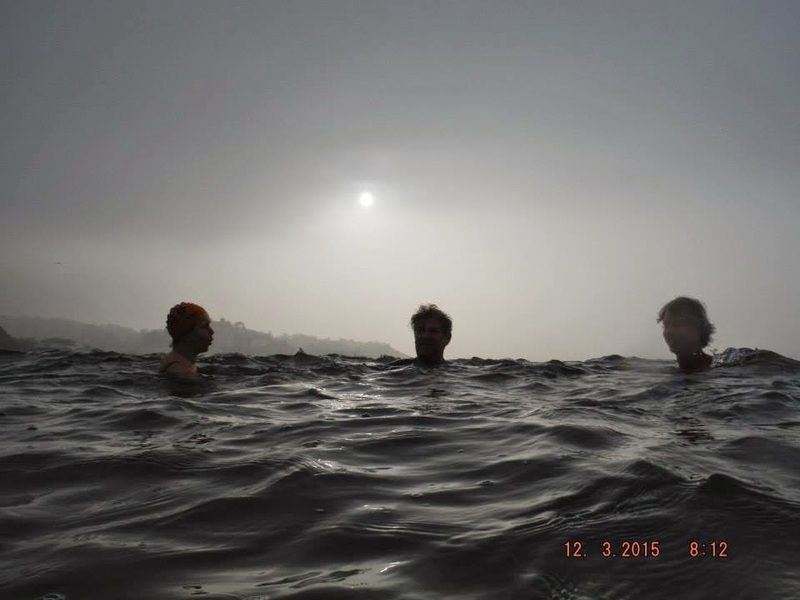 Th e lake was wreathed with hazy mist and it was a most magical, if rather chilly swim. 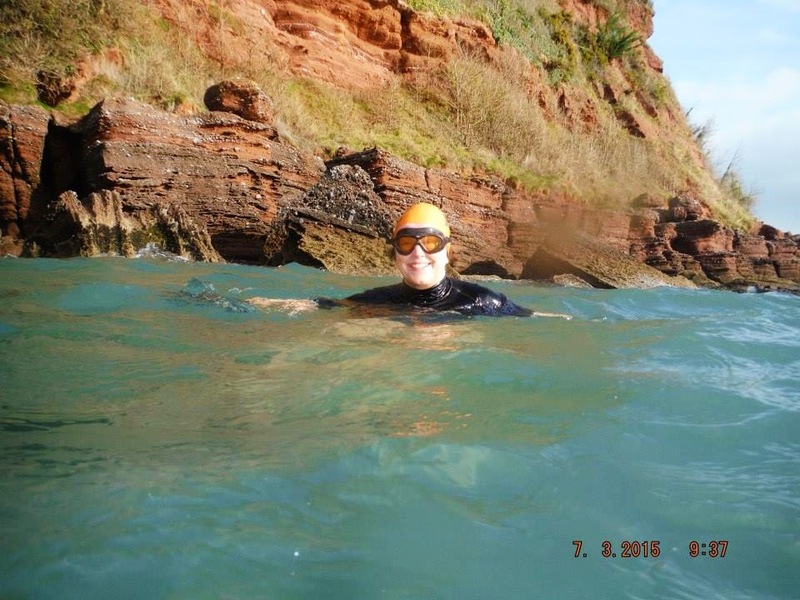 We met up for a breakast swim in Torquay. The sun was rising through the mist, an eerie, almost smoky greyness was everywhere, and it felt magical and blurred. In my day job I am a reporter for the BBC, and today we were doing an outside broadcast based in glorious Brixham, looking at tourism and the wonderful things to do here in Devon. 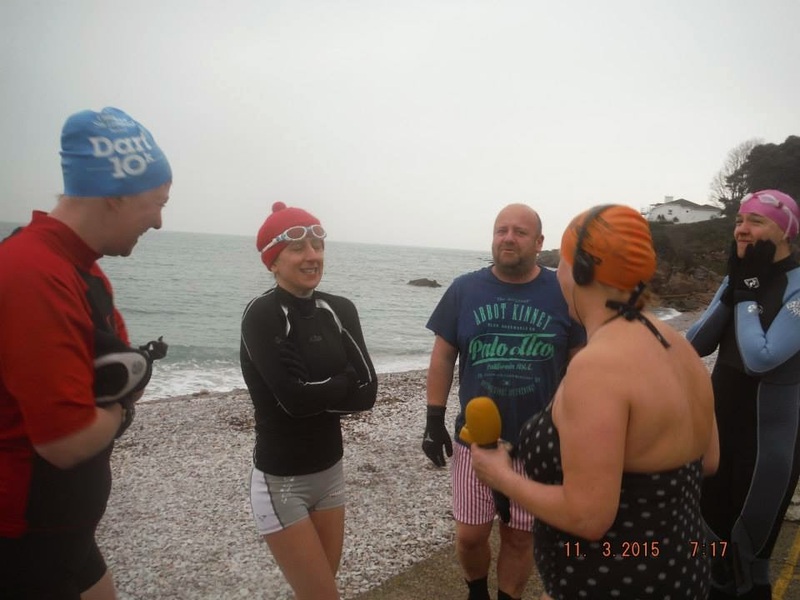 Well naturally a 'live' outdoor swim seemed like a brilliant idea, and so 7am found me down on Breakwater Beach with the radio car, clad in my swimmers whilst wearing headphones and talking into a microphone. (Undoubtedly the most unusual get-up in my professional life so far). 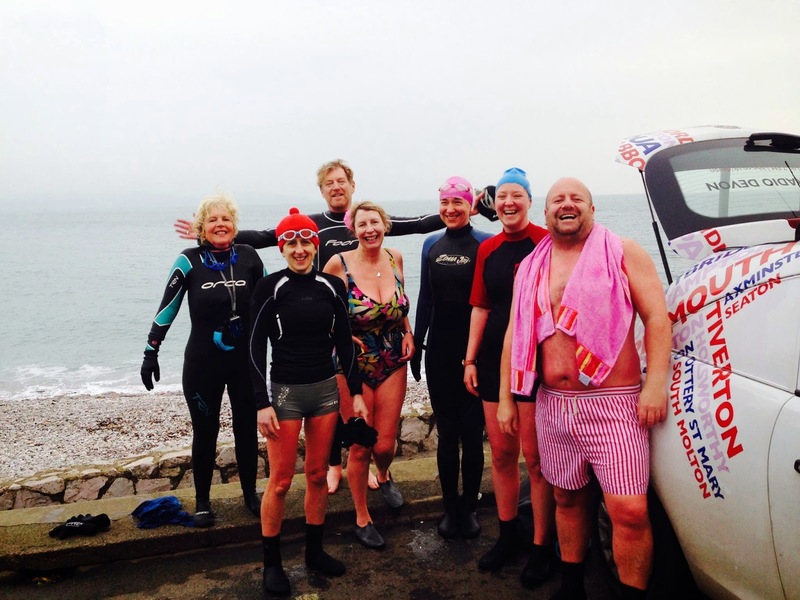 Fortunately I had some lovely chums who'd agreed to come down and wax lyrical about the joys of wild swimming, after which we ran down the shingle and into the water; all of which was relayed live to the listeners of BBC Radio Devon. (at this point I left the equipment on the beach to avoid electrocution). It was a dank old morning on Dartmoor, and as I drove over towards Torquay I was bracing myself for one of those rather overcast and dull swims. But as I got nearer the coast, the sun started to come out, and by the time I met Jackie, Anne and Kay at Maidencombe it was feeling positively spring-like. As we walked down the steps to the beach the sea spread out like a vast blue blanket, and I could see a splash of yellow primroses growing half-way up the cliff. 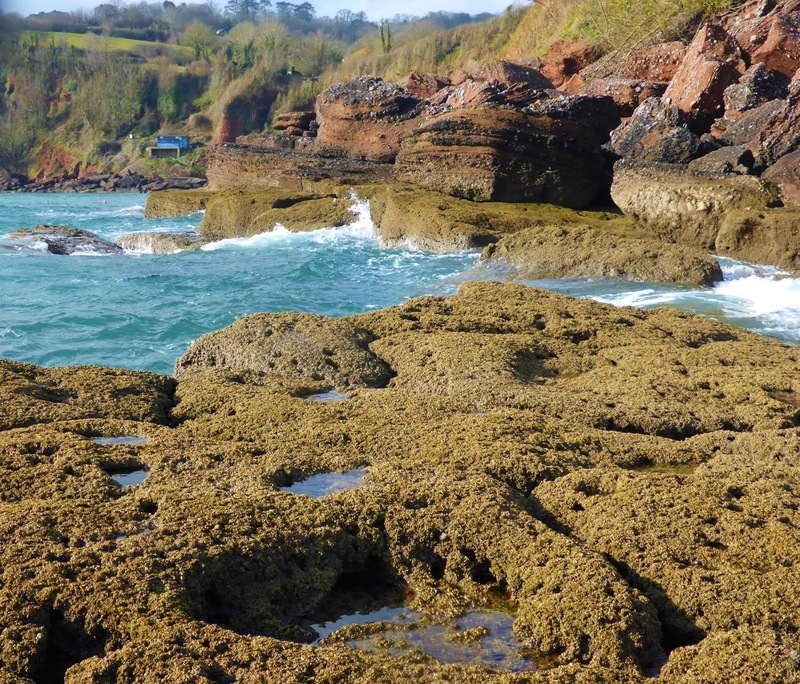 We got in, and swam along the northerly arm of the beach, past the intricate geometry of the red sandstone blocks which cluster the bottom of the cliff, and out to the edge of the cove, where we could see all the way up the coast to Shaldon. I've never swum out to this point before, and when I looked back I had a whole new perspective on the beach. Thanks to Jackie and Anne for their pictures. Outside my window the blossom is out. Birds are singing. The sun is shining. Inwardly, I am letting out a huge sigh of relief, because it finally seems that Spring is here. Today, Anna and I were finishing our session in the Torture Chamber (aka the gym) and we emerged, at about five fifteen, to glorious sunshine and LIGHT. 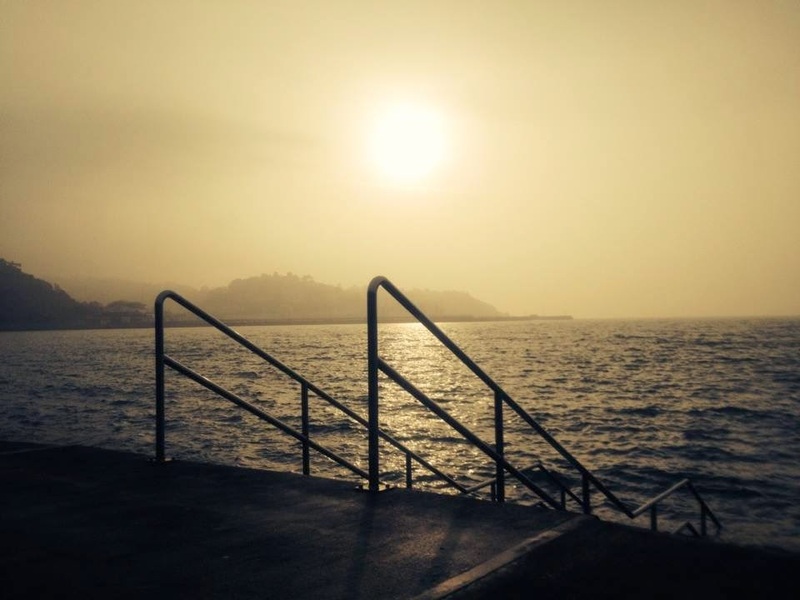 Spontaneously, we decided on a swim, and popped to our nearest pool on the Dart, the one we call the SSS (the swift swimming solution). We arrived to find the dwarf daffodils out, and the water smooth and inviting, with golden reflections of the clouds above. We were unprepared, so wore socks (plus in Anna's case, trainers) to keep our feet warm, which were surprisingly effective, so much so that we wondered why we bother spending money on wet shoes. The water was achingly cold on our unprotected hands, but delicious.